The Philadelphia 76ers’ rebuilding plan under general manger Sam Hinkie centered around draft picks and eventually selecting that franchise-altering player. But that plan drew criticism as the losses piled up and with the absence of that transcendent player. 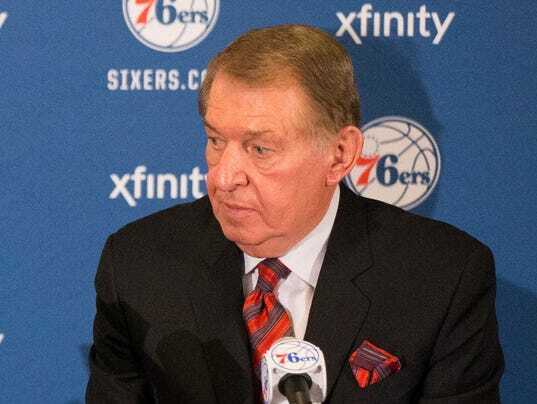 On Monday, 76ers co-managing owner Josh Harris announced that longtime NBA executive and one-time owner Jerry Colangelo, who is the chairman of USA Basketball, is the team’s new chairman of basketball operations and special advisor to the managing general partner. It signals a change in the Sixers’ rebuilding plan. NBA Commissioner Adam Silver had a significant hand in Philadelphia’s decision to hire Colangelo and placed a call to Colangelo to gauge his interest, two people familiar with the situation told USA TODAY Sports. They requested anonymity because they were not authorized to speak publicly about the private discussions. Don’t mistake this as a PR move or a consultation role. The 76ers hired Colangelo to rebuild the team faster than Hinkie.